To purists, the mere concept of video pinball may be wrong. But darling, Zen Studios makes it feel so very right. 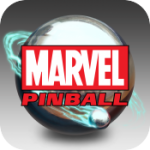 Time after time, they release detailed, deep, bright and blingy tables, and Marvel Pinball ($0.99) features some of their best work. Before continuing, there’s the IAP. Stay with me, it gets a bit obnoxious. 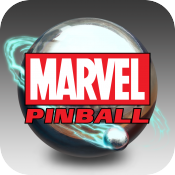 So: Zen Studios has already released Zen Pinball (Free), which (in addition to one free machine), already features 14 out of 15 of the Marvel tables. Marvel Pinball only comes with one table, Marvel’s The Avengers, and if you already own that table on Zen Pinball, then the only reason to get Marvel Pinball is to buy the Spider-Man machine, and it seems unfair to penalize diehards with a pointless admission fee. Every additional table is $1.99, the same price as if you’d purchased them on Zen Pinball. So the purpose of Marvel Pinball is dubious. That being said, you do get Marvel’s The Avengers at half price, so that’s something. Marvel’s The Avengers: As I mentioned, this is the default machine. And as the mandatory purchase, it’s pretty good. Based on the Joss Whedon-directed film, you’re tasked with battling Loki. All six Avengers from the film have their own ball, each with its own unique advantages. Though there’s dialogue from the film, they didn’t get the original cast, and it’s a bit weird hearing Tony Stark’s dialogue read by ‘Generic Smart Alec #3.’ But it’s still a fun table, and a good introduction to the Marvel pinball universe. Civil War: Based on the Civil War miniseries/cash grab, depending on who you ask, this was my least favorite of the four I played. It starts off well, with a disaster that leads to the superhero registration act. You then decide whether to take Iron Man or Captain America’s side, and attempt to recruit heroes and sway public opinion to your side. I tried it out thinking the combination of heroes would make for a fun, diverse table. It wasn’t bad, but compared to the other three, it felt lackluster. Serves me right for picking the table centered around a public policy debate. The Infinity Gauntlet: This is the flat-out winner of the bunch, and the app’s raison d’être. The plot is taken from the comic book miniseries of the same name, in which cosmic monkey dude, Thanos, controls some MacGuffins that make him all powerful. He erases a bunch of people from existence. Why? To impress a girl, of course. (Been there!) It’s a smartly designed table, features some beautiful art, and has great sound design. But best of all, it takes full advantage of the source material’s cosmic weirdness. There are so many delightful and disorienting moments that play around with physics, time, and perspective in a way that’s completely true to the comics. If I didn’t have to write this review, I’d be playing The Infinity Gauntlet right now. Spider-Man: With the look of The Amazing Spider-man, this is exactly what Spider-Man pinball should be. It’s colorful, fun, a little bit shallow, and corny. Those are compliments. J. Jonah Jameson yells at you, balls can swing home to smooch Mary Jane, and you get to battle Mysterio, Green Goblin, and Doctor Octopus. This is the only table not available on Zen Pinball, so it’s a little ridiculous it doesn’t come with the app. Every table has one thing in common: An uncommon degree of difficulty. Not rigged, like those ’60s pinball machines with tiny flippers. These are complex and sophisticated boards, with tons of ramps, prompts, and moving parts. Every table does include its own table guide, but you’re best off just aiming for whatever pockets or ramps are lit up, and just hope for the best. That’s what got me to 28,000,000 on The Infinity Gauntlet. That, and luck. I’ve got lots of affection for Marvel Comics and pinball, so seeing these tables brought a big, dumb grin to my face. IAP weirdness aside, this is an excellent package, and a great gateway drug for the pinball-deprived youth of today. Next PostNext ‘Way of the Dogg’ Review – Snoop Dogg, Fighting, Time-Travel… Need I Say More?